Romania ratings Author (SeeNews Wire) License: all rights reserved. BUCHAREST (Romania), October 23 (SeeNews) - Berlin-based privately-held rating agency Scope Ratings said it has downgraded Romania’s long-term local- and foreign-currency issuer and senior unsecured debt ratings to BBB- from BBB and affirmed the negative outlook. "The continued deterioration of fiscal performance and weak debt trajectory drive the downgrade. Sustained policy uncertainty underscores the Negative Outlook. The country’s high growth potential and moderate levels of debt support the BBB- rating," Scope Ratings said in a press release on Friday. Also, the short-term issuer rating was affirmed at S-2 in both local and foreign currency, and the outlook revised to negative. In August, Moody's Investors Service affirmed Romania's Baa3 long-term issuer and senior unsecured ratings with stable outlooks. Continued deterioration of fiscal performance with pro-cyclical budgets at the peak of the economic cycle. The wedge between fiscal revenues and expenditures has increased significantly following frequent tax cuts over the past few years. The situation is compounded by Romania’s tax collection system, which is one of the most inefficient in the EU. In addition, while expenditures remained broadly stable as a percentage of GDP in 2017, the budgetary composition has deteriorated, with an increase in consumption and salaries (0.8% of GDP) at the expense of much-needed public investment. A weak debt trajectory with the public debt ratio projected to return to its 2014 peak of 40% of GDP by 2020. Given negative structural and primary balances since 2015, previous debt reductions were driven entirely by high economic growth. The 2018 Convergence Programme submitted by Romania was based on optimistic growth assumptions, currently roughly 2 pp above recent IMF and EC projections for 2018-2021. Accordingly, the public debt ratio remains acutely vulnerable to growth outcomes which prove lower than government projections – a risk that is also heightened by the late stage of the economic cycle. In addition, given the high share of foreign currency-denominated debt (around 50%), a strong depreciation of the leu, leading to higher borrowing costs, would pose considerable risks to debt sustainability over the medium term. The downgrade of Romania’s sovereign ratings reflects changes in Scope’s assessments in the ‘Public finance risk’ category of its sovereign methodology. Romania's BBB- ratings are supported, however, by the country’s relatively high growth potential, moderate levels of public debt, and resilience in the banking sector. The affirmation of the Negative Outlook on Romania’s BBB- ratings reflects the ongoing political uncertainty and the associated risk of losing institutional credibility with investors given the sustained reluctance of the government to address repeated warnings by the National Fiscal Council and European institutions on unfavourable developments in public finances. In Scope’s view, the recent confrontation between the government and EU officials on a rollback of anti-corruption reforms has contributed to a further weakening of the government’s credibility. Thus, increasing political uncertainty and deteriorating institutional credibility raise the risk of the sovereign losing the market’s confidence at a time when the economic cycle is turning, exposing risks associated with financing Romania’s fiscal and external imbalances. The first driver of the downgrade is the continuous deterioration of Romania’s fiscal performance. While the country achieved its medium-term objective in 2013-2015 – i.e. a structural deficit of 1% of GDP, or progress towards this – the government has clearly departed from this path since 2016. In 2017, the government reported a structural deficit of 3.4%, reversing the consolidation trend of previous years through various tax cuts, including a large cut in VAT, which was initially reduced from 24% to 20%, and then to 19% as of January 2017. Consequently, tax revenues (VAT and income taxes) remain among the lowest in the EU, while the structural components of expenditures, namely wages for employees and pensions, have increased. In Scope’s view, the government has limited room to adjust both expenditures and the fiscal framework over the short run due to the narrow tax base. The second rating driver for the downgrade to BBB- is the unsustainable trajectory of public debt, with the debt-to-GDP ratio set to exceed 40% by 2021. Scope’s debt sustainability analysis confirms the worsening of the debt trajectory under the IMF’s baseline scenario. A more adverse scenario shows debt levels approaching 50% of GDP, even when assuming only a moderate shock to growth and to the primary fiscal balance (0.5 pp of GDP each in each year over the forecast horizon). Given that Romania lost market access during the financial crisis in 2009, with debt ratios of 22.1% of GDP, the current trajectory may result in elevated pressure from financial markets even though its debt ratio remains below the 60% Maastricht threshold. In the long run, Romania faces an additional long-term challenge driven by the steep increase in the dependency ratio, which is set to rise from 49.1% in 2016 towards 70.1% in 2040. At the same time, the BBB- rating acknowledges that Romania has been one of the fastest growing economies in the EU, with real annual GDP growth averaging 4.8% over the last four years and reaching a peak of 6.9% in 2017. This has led to a strong convergence of income, although purchasing power-adjusted GDP per capita remains far below the EU-28 average (62% of the average in 2017). However, economic activity lost momentum in 2018 2018 due to conjunctural external and domestic factors. During the second quarter, real GDP grew at an annualised rate of 4.1%, a notable slowdown compared to 2017 (6.9%) but in line with Scope’s earlier projections of medium-term growth potential. Going forward, the country’s upward growth potential remains limited given the large skills mismatch in the labour market and relatively low absorption of EU funds, combined with the low predictability of domestically legislated infrastructure projects. This situation also reflects the lack of effective local bureaucracy and officials’ management abilities and is one of the reasons for Scope’s affirmation of the sovereign’s Negative Outlook. The National Bank of Romania has tightened its monetary policy stance, with the policy rate now at 2.5%, 75 bp higher than in 2017. Despite the three hikes in January, February and May, monetary authorities remain under pressure to tighten conditions further as fiscal policy remains pro-cyclical, raising consumers’ and retailers’ inflation expectations. Scope expects that higher interest rates will increasingly dampen private consumption and investment, thereby increasing the probability of a significant drop in economic activity, which is mainly driven by domestic consumption. Romania’s trade deficit widened by 14.5% year-on-year between January and May 2018, increasing the country’s vulnerability to short-term shocks. The current account was negative in previous years and is expected to remain below -3% of GDP going forward. Higher than expected inflation may weaken the leu. This would increase the burden of foreign-currency-denominated public debt, which stands at 18% of GDP. The country’s negative net international investment position has steadily improved to 40% of GDP in July 2018 based on high growth, while deteriorating in nominal terms. External competitiveness with Romania’s trading partners remains weak based on higher inflation, which is only partly compensated for by the leu’s depreciation. A change in global risk appetite, combined with weaker investor confidence, could reduce current international reserve buffers, covering five months of imports, and stable external debt levels at 50% of GDP. 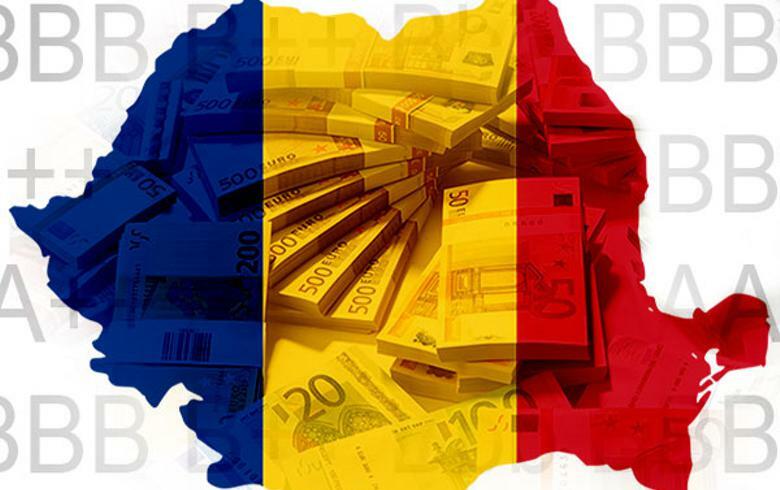 Finally, Romania’s financial sector has become more resilient and profitable in recent years. Non-performing loan ratios have been reduced to 6.4% of total loans, down from 22.2% in 2014. Nevertheless, the sovereign exposure of domestic banks (20% of assets) still ranks among the highest in the EU. While the risk of a sovereign default remains low, higher interest rates reduce the value of the banks’ current bond holdings. With regard to household debt, exposure to real estate has increased substantially over the previous decade. The ‘prima casa’ programme allows loan-to-value ratios of up to 95 percent, and contracts at mostly variable rates pose risks to financial stability given the higher interest rate environment. Scope’s Core Variable Scorecard (CVS), which is based on the relative rankings of key sovereign credit fundamentals, provides an indicative ‘bbb’ rating range for Romania. This indicative rating range can be adjusted by the Qualitative Scorecard (QS) by up to three notches depending on the size of relative credit strengths or weaknesses versus peers based on qualitative analysis. For Romania, the following relative credit strengths have been identified: i) high growth potential. Relative credit weaknesses include: i) the fiscal policy framework; ii) debt sustainability; iii) current account vulnerability; iv) vulnerability to short-term external shocks; v) recent events and policy decisions; and vi) financial imbalances and financial fragility. The combined relative credit strengths and weaknesses generate a one-notch adjustment and indicate a sovereign rating of BBB- for Romania. A rating committee has discussed and confirmed these results. Scope considers ESG sustainability issues during the rating process as reflected in its sovereign methodology. Governance-related factors are explicitly captured in Scope’s assessment of ‘Institutional and political risk’, in which Romania scores poorly in terms of the World Bank’s Worldwide Governance Indicators. Romania also has a low score in this area compared with EU peers such as Croatia or Bulgaria. With regard to qualitative governance-related factors, ‘Recent events and policy decisions’ are assessed as ‘weak’ in Scope’s QS, reflecting political instability. Socially-related factors are captured in Scope’s CVS, with Romania’s low level of GDP per capita and sharply increasing dependency ratio weighing on the country’s rating. The score positively reflects the low unemployment rate and high growth rate. Qualitative assessments of social factors are reflected in ‘Macro-economic stability and sustainability’, for which Scope assesses Romania as ‘neutral’, balancing a high-growth economy with heightened inequality levels, high poverty risk and social exclusion. When comparing the 20% highest-income households with the 80% lowest-income households (S80/20-ratio), Romania has shown improvement since 2016 but still ranks among the most inequal societies in Europe (high-income groups earn 6.5 times as much as low-income households, down from 8.3 times in 2015). The affirmation of the Negative Outlook reflects Scope’s view that risks to the ratings remain elevated. The ratings could be downgraded in the event of: i) a further deterioration of public finances; ii) a large depreciation of the national currency, aggravating public finances and the balance of payments; and/or iii) the further reversal of institutional reforms. The Outlook could be stabilised and/or the ratings could be upgraded if effective policymaking leads to: i) a strong improvement in the fiscal framework; ii) a firm downward path for the public debt trajectory; and/or iii) the implementation of structural reforms to the labour market and judicial system."